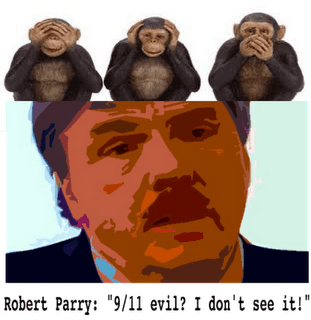 Why is ROBERT PARRY so AFRAID? My problem with you was never that you disagreed…though I do not believe you have really seriously looked into 9/11 in view of your extreme hostility from the start and what we talked about that long day at your home and while walking around Arlington; after all I’m well aware that different people have different blind-spots and sensitivities. My serious problem with you is your continuing defamation and name-calling and insulting of other very dedicated and serious persons who have in fact, at great time and dedication and hard work, come forth with considerable evidence and more. Simply said Bob you are not the only person who seriously investigates things and in fact I’m certain that if you would ever agree to debate anyone on a whole list of persons about this in public you would lose badly. Parry is publisher of Consortium News and constantly asks all concerned about our country and independent journalism to support and finance him. But when it comes to 9/11 Parry refuses to publicly debate David Ray Griffin or any other major 9/11 personality, plus he likes to point the finger at the Saudis but refuses to do so when it comes to the Israelis and their powerful Israeli/Jewish lobby not to mention the Zionist Neocon brigades who held near-complete power in the Bush/Cheney Administration when 9/11 happened. Oh yes, let’s be fully candid and serious here. Parry does lambast the Neocons harshly. But he refuses to highlight that nearly all of the leaders are Jewish, dedicated Zionists, and many are even long-time Israeli-connected operatives in one way or another. And most of all he never connects them to and always protects them from possible involvement in 9/11, even while noting that they did pray for “a new Pearl Harbor” and immediately catapulted their extreme Middle East war policies on top of it.